Preheat oven to 165°C/325°F. Chop almonds and walnuts. 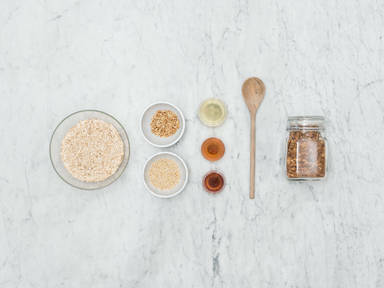 Add rolled oats, honey, maple syrup, vegetable oil, and chopped nuts to a bowl and stir to combine. Transfer mixture to a baking sheet in an even layer, lined with parchment paper if using. Bake at 165°C/325°F. for approx. 30 min. or until golden brown, stirring after 20 min., then checking every 5 min. Remove from oven, allow to cool, and transfer to an airtight container. Enjoy on top of your breakfast bowl or with yogurt!